You will find in NORTH PATAGONIA all the kinds of waters you dreamed of. From big and wide trophy rivers like Chimehuin to the perfect size trout stream as Malleo, the area offers all the choices you are looking for. As you can see in the MAP, our influence area is really big, and gives us the opportunity to try many different kinds of streams and they are not really far away. Up on the north Pulmari, Rucachoroi, Malalco and Quillen rivers are incredible dry fly fishing places. 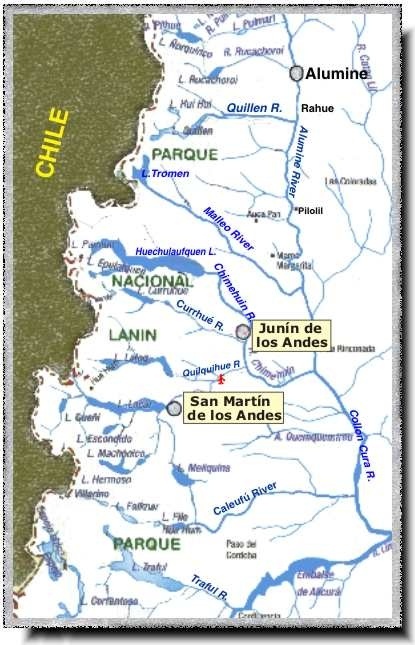 All along the valley Alumine and Collon Cura are the perfect rivers to float as well as the productive Caleufu. Then the World famous Chimehuin will give you both chances, wading or floating. Do not forget the amazing dry fly fishing in the lakes !! !